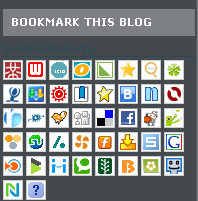 This Article will tell you how to add Social Bookmarking Buttons in your Blog. First i will tell about chicklets and Badges for side then Badges for post. (i) About addthis --> In your account click Get Your Button at top, select type where you want to put this button example : Blogger,Website,wordpress etc, Select type of button, at this time there is 10 types, Click install to side bar and choose blog or Copy and paste given code in widget in side bar. (ii) Now about gigya --> In your account click Get Wildfire at top left side. Now chhose bookmark button from left menu, here you can choose gigya defaul button or enter image url what you want in Customized - Enter image URL: Box. Choose button behavior ,fill Bookmark title, Copy code from Grab Code and paste in side bar. It consist of two step one to add code in CSS part and second is Style sheet part. To add Code follow these steps. These are small badges of bookmarking sites which are open and not hidden by chicklets. To put badges in side bar copy and paste given code below in side bar widget. Note ; Some Bookmarking Sites are in Detuch. These are include in post at the end of each post. For automatic inclusion we have to edit template and paste code in it. 1. Login your blogger account. 2. Go to html section through layout. Backup your existing Template before adding code for restore if you want back your format like before.For download click Download Full Template and save on your hard drive. 3. Now in this part here i am mentioning about two types Static Badges and Auto Hidden Badges.We first discuss about static badges and then Auto hidden badges code. 4. Mark Box Expand Widget Templates in your right side. 5. In your template find this line <b:include data='post' name='postQuickEdit'/> by pressing ctrl+f from keyboard and paste this link in popup box. These type of badges always remain hidden but on mouse over they show. Adding code for this is slightly diffrent than static badges, actually we have to modify template in two parts CSS and Style sheet. 1. Now for adding code go to your template as above, make its backup. 2. Find this tag in blue in to html sheet </head> easy way is to press ctrl+f and paste in search box and find. 3. Copy and paste give code 'in box below' just "above it" like in box below. 5. Now copy and paste given code in box below just after it like in box. 6. You can change the feed code in yellow color above with your feed code.This is feedburner code, you can get more information here.